Can you host a Time Trial in 48 hours - please? 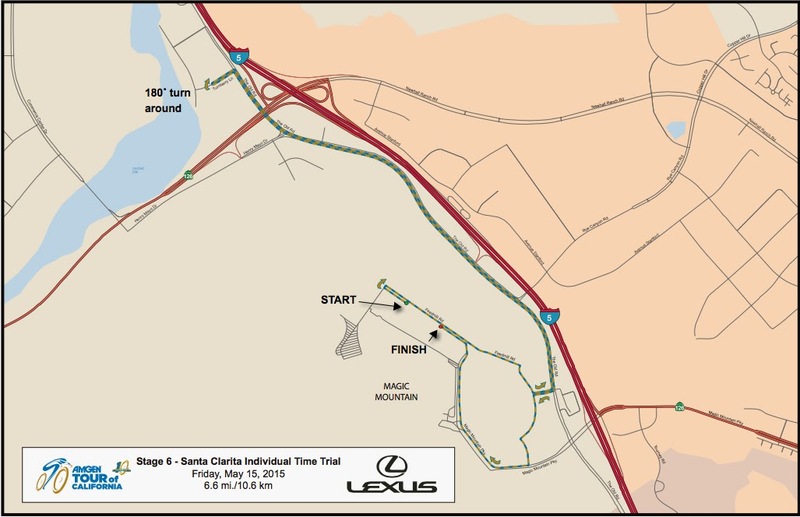 And make that a time trial course which is part of an American Tour UCI 2.HC stage race. With 18 teams of 8 riders each and lots of support cars and personnel, team buses, supply trucks, VIP tents, sensitive timing equipment, TV trailers and cameras, a LOT of fencing, and an entire Expo "Lifestyle Village". We'll need numerous new volunteers and plenty of local police. Oh and don't forget to tell the caterers we moved to another city 2.5 hours away! And the neighbors, we gotta tell the neighbors ... a time trial will be in town all day this Friday during normal business hours. Can you imagine? 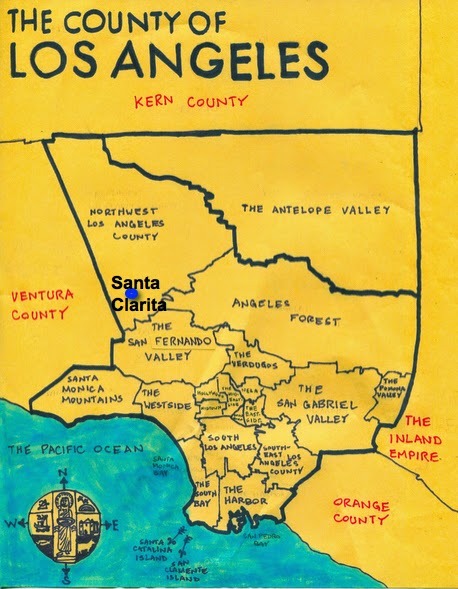 Only Santa Clarita, California would say - sure, we can do that. 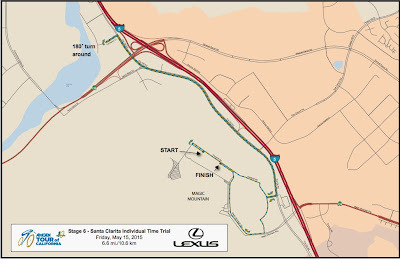 Stage 6: Friday, May 15 – Big Bear Lake (ITT) CHANGE OF LOCATION TO Santa Clarita (route map to be announced on May 14th). They moved it down a mountain and two and a half hours away and it will still rain on the time trial, but I am certain all the support trucks and the riders will be much happier at lower altitude. A place where all can safely stay overnight in a hotel and not have to navigate up a snowy mountain side, in a bus, to race a bike outside in very cold windy conditions. If you have to move such a huge operation as a pro cycling time trial, Santa Clarita is probably the city to help you out. 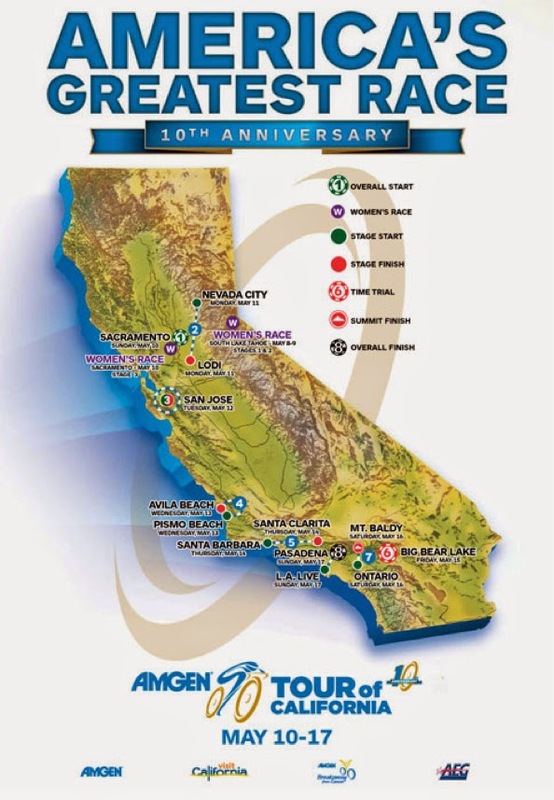 Did you know that Santa Clarita has been a Host City for 7 out of 10 years of the Amgen Tour of California, sometimes hosting two stages in a year. Santa Clarita was not a Host City for the inaugural Tour of California in 2006 - which started in San Fransisco and finished in Redondo Beach - but the city quickly became a staple location of the race in following years. We all know people make a city, and so I'd like to give high praise to city officials and race organizers for being gutsy enough to change plans and keep everyone safe. I imagine them working around the clock to pull this feat off. Last week I drove through three snow storms from Colorado to California to get to this race, but I was not looking forward to driving up that mountain in a California spring storm. A mountain I am familiar with, yet I was terrified of that drive as a child (I am a native Southern Californian); they did the right thing by changing locations. 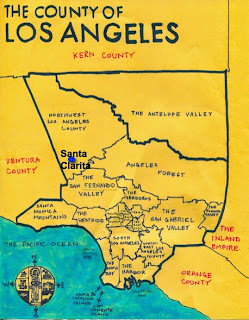 Let's all go to Santa Clarita! and Mt Baldy! and Pasadena! 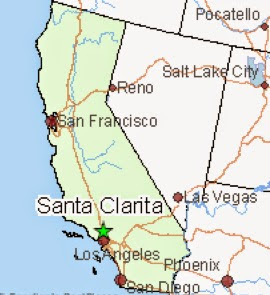 Santa Clarita is the third largest city in Los Angeles County (mostly because Los Angeles County is made up of a lot of cities). In the 1800s, this was gold and railroad country, as mission and ranch land spread across California. Oil was soon discovered in the area, followed by Hollywood movie sets and bigger stars. In 1928, the second worst disaster in California history occurred in this area when the St. Francis Dam collapsed and spilled its waters all the way to the Pacific Ocean near Ventura. With a warm dry Mediterranean climate, Santa Clarita is one of the top areas in the nation for wildfires. It is also a very well organized city to be able to organize resources for an event like this in two days! Please come out and show your support for this very hospitable city. Stage 6: Friday, May 15 – Big Bear Lake CHANGE OF LOCATION TO Santa Clarita (new ITT route map Amgen TOC_Stage 6_Route Map).